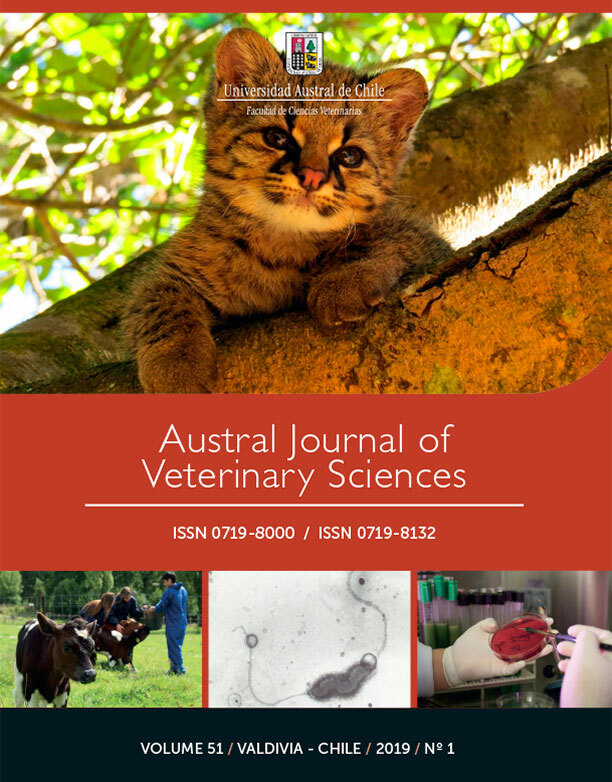 Austral Journal of Veterinary Sciences, formerly Archivos de Medicina Veterinaria, publishes original scientific contributions in English, containing the latest developments and discoveries in veterinary sciences. The journal covers topics such as animal health and production, preventive medicine, zoonosis, pharmacology and therapeutics, methods of diagnosis, and other areas related to the veterinary field. Austral Journal of Veterinary Sciences aims to divulge information about advances in veterinary medicine among universities, research centres, industries, government agencies, biologists, agronomists and veterinarians. Cover: Towards regenerative therapies in wild felids: Mesenchymal stem cells isolated from guigna (Leopardus guigna). Photograph captured by Dr. Paula Aravena (Facultad de Cs. Veterinarias, UDEC) and provided by Echeverry et al.